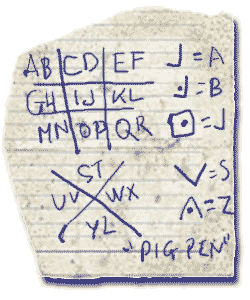 The pigpen cipher (aka. masonic cipher) is a very simple substitution cipher, that goes back all the way to the 18th century. In "Pigpen" the 26 letters of the alphabet are placed in two grids. The first grid looks like the grid you would draw to play tic-tac-toe. The other grid is like a big "X". 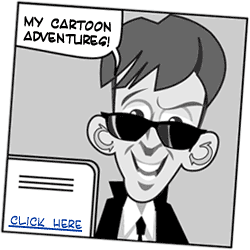 Now, for each character in your message, draw the lines that make up the spot the letter is in. So for the letters "A" and "B", draw a line right and up. "G" and "H", draw a line right, then down, then left. And so forth. So, when you draw the code for "A" or "B", when is it an "A", and when is it a "B". That's easily signaled... if it's the first character in the pair, leave the drawing as is. If it's the 2nd, put a dot inside the area. See the examples in the drawing to see how this looks. Here is a coded messages to practice this. This one example really is enough to get the hang of it. the actual message can be found somewhere on this page. Now, move along, and use this knowledge with discretion!